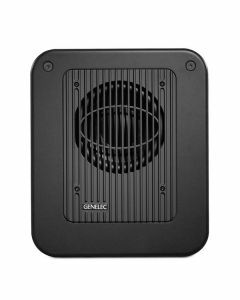 The Genelec 7350APM SAM™ subwoofer provides outstanding monitoring accuracy and flexibility in a very small footprint. Intended to sit comfortably in smaller studios without skipping the demands of the most ambitious audio productions, the Genelec 7350A subwoofer perfectly compliments the rest of the Smart Active Monitor (SAM) range. In spite of its space-saving dimensions, the subwoofer manages to fit in an 8” woofer and powerful Class D amplifier to produce 104 dB of undistorted SPL. Low frequencies are stretched down to 22 Hz, while Genelec’s Laminar Spiral Enclosure (LSE) ensures uncompromising accuracy and enriched, colour-free low end capacity. Genelec’s 7350A is made to adjust to and capitalise on any aspect of a modern acoustic setting, courtesy of a suite of augmented technologies. As studio space increasingly becomes more confined and listening areas limited, so recordings are taking place in a broader array of locations – a great deal of which with negligible acoustic treatment. The Smart monitors and Smart subwoofers of the Compact Series are built to adapt and assist. The 7350A SAM utilises cutting-edge AutoCal technology to create an optimised and regulated monitoring environment, and are controlled by the proprietary Genelec Loudspeaker Manager (GLM) 2.0 software. Monitoring set-ups stretching from basic stereo to immersive audio can be consistently executed, after automatically calibrating and compensating for deficiencies in the listening environment.